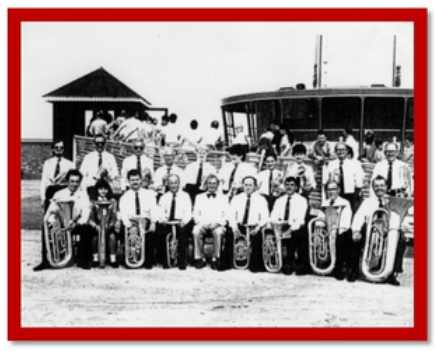 The year 1877 saw the formation of Rhyl Silver Band by a group of local men who thought that it would be a good idea for the town to have a brass band. They originally named it The Rhyl Town Band. Mr Rhydwen Jones, a partner in one of the towns largest furniture stores, was one of the first sponsors of the band and allowed the use of a warehouse, at the rear of the store in Queens Street, as a rehearsal room. The store also purchased the first set of instruments the band used. The original uniforms and instruments are now long gone, but we have our suspicions about one or two of the more senior players! The first Bandmaster (Musical Director) was Mr David Owen, a local man who distinguished himself throughout Wales as a band trainer and composer. Some of his descendants are involved with the band to this day. In the 1890s the band was invited to become the official band of the 3rd Volunteer, Royal Welsh Fusiliers. They accepted the honour and moved their rehearsals to the Old Armoury in Windsor Street. During the early 1900s the connection with the military was ended and the band moved its rehearsals to an old barn at the rear of Windsor Street. Rehearsals continued in this barn until the 1930s when, through the efforts of band members and the band committee, the present two storey band room was built on the site. This consists of a practise room downstairs and a social room upstairs. The band room opened in 1937 but at the start of the war in 1939 it was requisitioned by the Ministry of Food and used as a store room. The band rehearsals were based for the next six years in a classroom at the old Christ Church School in Vaughan Street. From 1933 the band had been conducted by the well respected Mr Tal Morris who came to Rhyl from the famous Gwauncaegurwen Band in South Wales. He stayed with Rhyl until his death in 1945. Following Mr Morris death a replacement Bandmaster was appointed, also from South Wales. This was Mr Reg Little previously of the famous Cory Band. The band experienced many successes under his leadership culminating in the winning of the National 2nd Section Championship at the Royal Albert Hall, London in 1949. After Mr. Little left in 1957 the band had mixed fortunes under a number of conductors, including Mr. D. Morris, the son of Tal, who had been a euphonium player with Fodens Motor Works Band. Whilst being conducted by the very experienced Mr. J.T. Conway the band competed in the Grand Shield at Belle Vue, Manchester. Mr. Fred Flynn was another notable conductor to work with the band during this period (again a very experienced euphonium player with Championship Section Bands. (Manchester CWS Band, Fodens). Right up to and including the 1970s Rhyl had a good, strong band but by then it started to go into decline. By the mid 1980s it reached an all time low. There were as few as six players attending rehearsals with no prospect of a revival. A General Meeting was called to consider closing down the band. It was well attended by supporters and former players and the decision to try and carry on was taken, with Mr William (Bill) Hind, a local peripatetic music teacher becoming Musical Director. Musical Director Mr Hind did not stay long and a few months later Mr Gwynfor T. Davies took over. Mr Davies had played with Rhyl Silver Band in his youth and gone on to a very successful playing and directing career in the theatre world. He became overall musical director for Moss Empire and in that time conducted a Royal Variety Performance. It was due to Mr Davies expertise and an enthusiastic band committee that things began to improve, so much so, that at both and emergency meeting and the first practise later, that a regular full band emerged. With player numbers at the required level re-entry into the contesting arena saw success return once again. Prizes were won at the National Eisteddfod and other contests. Qualification for the National Finals in London was achieved and the Rhyl Silver Band gained a reputation as a very good concert band. Qualification for the Millennium National Finals at the Royal Albert Hall demonstrated how well the band had fought back from adversity. At the time of this reformation the band had no uniforms and no money. The first uniforms consisted of blue pullovers, black ties and black trousers provided by the players themselves. They were later given a partial set of uniforms by Point of Ayr Colliery Band, who had bought a new attire and Rhyl Silver Band used what income it had to complete the set. In 1991, Rhyl Town Council gave a large donation to the band to go towards new uniforms. By using all income from concert work and members subscriptions, a new full set of scarlet jackets and black trousers/skirts was purchased and the band was really back in business. Subsequently a grant was secured from the National Lottery to buy new instruments which, in turn, allowed the older instruments to be donated to the youth and learner bands. This meant that learners could be provided with an instrument to take home to practise with, experienced players always being on hand to provide free tuition. Unfortunately more recently, the band is rebuilding after suffering player losses with some moving to live away, others retiring from work and banding and younger members also move away to study. The well tested method of replacing them with members of a youth band at an appropriate time is proving very difficult at present, with so much competition for the younger persons time, from computer games, sports and other pastimes. Those young people that we do have can testify that banding is a lot of fun and a really worthwhile hobby. Learning music is fun and for many has the added benefit of leading to full time musical careers. With schools having to curtail music lessons in the current economic climate, brass banding and bands like Rhyl have an ever increasing battle to keep music alive whilst a duty to keep the young occupied. Despite all the gloom, there are signs that things are starting to look bright and with yet more hard work for certain dedicated individuals within the band, new young people are being encouraged to come directly to the band for tuition, replacing the service previously provided by schools. Additionally the opening of the RSB Social Club on weekends and certain weekday evenings has proved a very successful move with many more people getting involved with the band. Long may it continue! Adapted from the 1997 short history compiled by Nia Lloyd Williams.